Cast iron charcoal bowl with British oak legs. Pre-seasoned cast iron cooking bowl (4 litre capacity). Glazed ceramic tagine lid with British oak, hand turned knob. The tagine lid is hand thrown and painted by Rachel Frost in the Ironbridge Gorge, Shropshire. It's simple and quick to light. 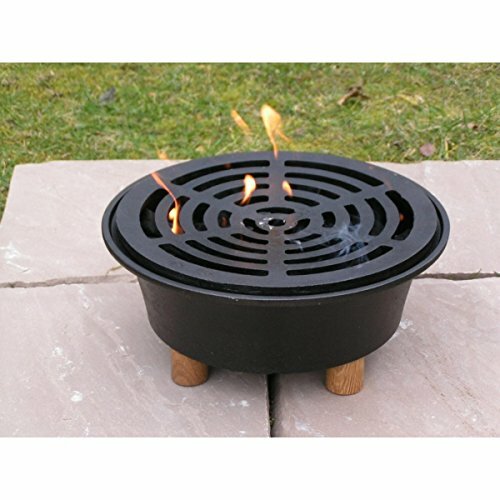 Just fill it with lump charcoal, pour on 150ml (5 fluid oz) of barbecue lighter fluid, replace cast iron grid, stand back and light. Wait for 20 to 30 minutes until the charcoal has become grey/white and then start to cook or barbecue. It can be used on decking as well as on the patio. Tagine and slow cooked dishes cook in 3 to 4 hours and stay hot for around 5 to 7 hours. This leaves you plenty of time to relax and entertain. It's great for family parties, a quiet evening in the garden watching the sunset or delicious warming food during a fireworks party. All of the cast iron parts are pre-seasoned with flax oil for a natural, easy clean finish. Use the Garden Hob to "brew up" by adding one of our traditional 3.5 pint or 5 pint kettles. Try a great outdoor breakfast on the Garden Hob by adding one of our Spun Iron frying pans. When the weather changes for the worse, you can use the cast iron cooking bowl indoors. 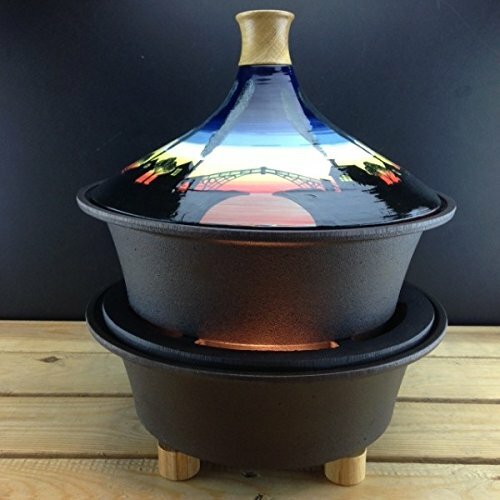 Turn it into an electric tagine by adding one of our electric heater bases. Alternatively the bowl can be used on your gas or electric hob. Cast iron cooking grid Pre-seasoned cast iron cooking bowl (4 litre capacity).